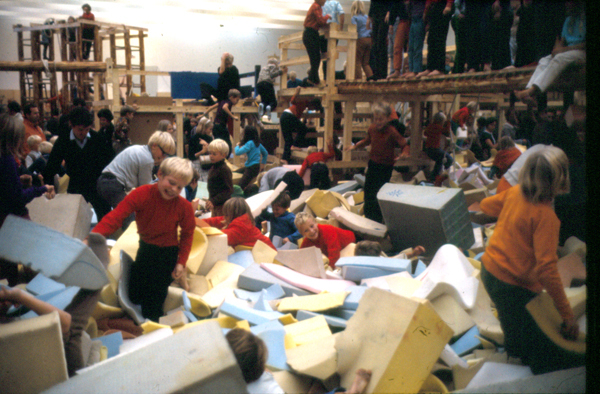 In 1968 the Moderna Museet, Stockholm and artist Palle Nielsen created The Model – a social experiment involving 20,000 children, an indoor playground and no rules. The Model positioned children’s play as an instrument for social and political activism. This post features discusses The Model as well as Nielsen’s work as an artist, educator and social activist. In 1968 Danish artist Palle Nielsen exhibited a giant adventure playground at the Moderna Museet, Stockholm. The Model – A Model for A Qualitative Society was a free play zone where children could jump off bridges, swing from tyres, make things out of DIY tools, climb rope swings, paint and mix music using turntables. From September 30 – October 20 1968, The Model hosted 35,000 visitors – 20,000 of them young children. The installation was free to all visitors under the age of 18. Kindergartens and school groups from all over Stockholm were invited to visit in a grand attempt to integrate new members of the community into the gallery space. Prior to creating The Model, Nielsen had been building unauthorised adventure playgrounds in disadvantaged areas of Copenhagen. A practice which he saw as supporting the mobilisation of children as social activists. The 1960’s and 70’s in Scandinavia also saw the rise of the progressive child-centered education movement that advocated for children’s democratic right to participate in the formation of communities – a principle that resonated in The Model. Nielsen’s intention behind The Model was to challenge the social elite connotations of art and art museum culture through the ‘creation of a collectivist human being.’ At the time of the installation being exhibited, he was quoted as saying, “I wanted to deconstruct ‘the white cube’ as the idea of an art museum… The idea of an art museum was to be changed by the live presence of active, playing children in the museum.” The Model sat between an education project, art installation and political protest. Following The Model Nielsen was shunted from the Danish art academy where he was completing his PhD in architecture. After continuous criticism from critics and increasing isolation from the art world, he become a teacher in adult and community education centres in Denmark. In 1998 he was contacted by art critic Lars Bang Larsen who was writing a paper on The Model for an art journal. Following the paper’s publication there was a wave of resurgent interest in Nielsen’s art practice, Nielsen agreed to donate the documentation of the project to Museu d’Art Contemporani de Barcelona. The documentation was exhibited at MACBA (2010) and Tate Liverpool (2014). A replica of The Model was presented at the ARKEN Museum for Moderne Kunst, Denmark from February 9 – December 7, 2014. If The Model had been two continents closer and 30 years later, I would have been at it for sure. What fun.